" Grove Park Inn - Asheville, NC - C1935." (1264) POSTCARD: Grove Park Inn - Asheville, NC - C1935. -Condition: Very Good.- Not Posted. 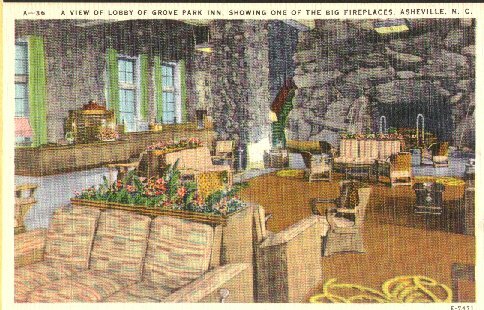 Colored picture of lobby of Grove Park Inn. Printed Information about the Inn on the back. Mentions that it is fireproof. Built from granite boulders hewn from Sunset Mountain, The Grove Park Inn opened in 1913. It was modeled after the grand old railway hotels of the West. Note lines on photo caused by scanner and not on the postcard. Price: $3.50 + shipping.